So although this story is a few days behind (well weeks) it was too good to not tell. On our last day in the hospital a nurse was showing me how to help bathe the baby. All things were going well until I heard the slightest little toot. Then, well, then all hell broke loose. Josie let out a fart/poop that had such force it shot out of the bassinet, across the room and hit the privacy curtain, the wall, and the door. The nurse was so shocked she just sort of stood there for a few minutes, that was enough time for Josie to move on and start peeing all over everything. Then as we were beginning to clean up this explosive mess, little dainty Josie let another poop rip all over her bassinet (needless to say some items such as the weight chart from her bassinet are not going to be making it into her baby book). The nurse who was helping me said after we were done cleaning and sanitizing everything that in her almost 30 years of being a maternity ward nurse she has never seen a baby poop with such force it shot out across the room. Look at my little girl already breaking records!!!!!! How coincidental that I was offered to review this book a week before Josie was born. I thought that this was just going to be another "What to expect when Expecting" but was very pleasantly surprised to find that this was a quick, informative read for anyone who is expecting. This book covers all topics like pregnancy, to birth, to nursing, even potty training. Although my personal favorite chapter was the chapter titled "Every Child is Genius, not just yours" which gave great insight into not only that is OK to be proud of your child, but to realize that everyone is as proud of their child as you are of yours. I thought that this would be a great gift to give any expecting friend on her journey to motherhood. It is filled with great tidbits of information but not overly medical in nature. I also liked that there were always fun, is published by by parenting expert and SheKnow.com contributor Jen Klein it has a lot of useful websites that a new mom or mom to be could use to her benefit. Being that this is a nice quick read (I read it the first four days I was home from the hospital) I would say it is a must for every expectant mom!! 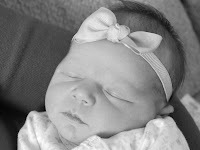 Well as some of you may have noticed I have been absent from the blogging world, with good reason on March 29th and 7:55 I had my beautiful daughter Josephine Rory Hunt (aka Josie). She was a petite 7 pounds 12 ounces 19 inches (every doctor said she was going to be well over 8 so I was shocked when she was that small). This time around I had a planned c-section which was an odd experience to say the least. It is weird to know that when you wake up that day that in less then three hours I would have a new baby in my life. I was actually really scared to get an epidural this time around, since last time I was in such pain after 12 hours of labor I didn't care what they stuck in my back, but that was no painful at all. Sadly, due to some unforeseen complications with scare tissue from my c-section and only giving me a spinal that only lasts about an hour and half, my surgery was very very painful, to the point that it really takes away from the birth of my daughter. Apparently spinals only last for an hour 1/2 to two hours and my surgery took much longer then expected to the spinal wore off before my surgery was over and lets just say it was no a pleasant experience. Yet, when all was said and done I had my beautiful baby girl and that is what is really important. After a few days in the hospital we came home and I can't get over how different it is the second time around. I feel 100 times better, 100 times less stressed, and 100 times more confident about nursing. Don't get me wrong there are times where doing the newborn thing is still super hard but this time I am not feeling as overwhelmed, things are going great. So great the cynic in me is waiting for the other shoe to drop, but for now I will enjoy it. Here is to a great start to my maternity leave!! !